neurological disorders, severe allergies or immune system problems? name and lot number, for all vaccinations? 6. Get adequate sleep and lower stress. Right now, influenza vaccine virus is grown in the fluids of chicken embryos but vaccine manufacturers are experimenting with using other growth mediums like insect cells and dog kidney cells for production. It is a good idea to always read the manufacturer product information insert for a description of how a vaccine is made. Calculator are available at NVIC.org. Have Flu Vaccines Been Proven Safe & Effective? Although public health doctors now recommend that all Americans from six months of age through year of death get an annual flu shot, there have been no large, well designed, long term studies to demonstrate that this policy is necessary, safe or effective. A comprehensive review of published influenza studies revealed that most studies are flawed and have not demonstrated that influenza vaccine is safe or effective in preventing influenza in adults or children. Vaccines, including flu shots, stimulate a temporary, partial immunity. Vaccination does not exactly mimic the natural disease process and does not give longer lasting immunity that most healthy people get naturally after experiencing and recovering from infectious diseases, including influenza. Can Flu Vaccines Cause injury or Death? Vaccines, like prescription drugs, are pharmaceutical products that carry a risk of injury or death. Vaccine risks can be greater for some than others depending upon a person’s health at the time of vaccination, personal and family medical history, whether there has been a previous vaccine reaction, and other factors. Vaccines stimulate the immune system to mount a temporary inflammatory response so antibodies are produced. Sometimes the inflammatory response stimulated by vaccination does not resolve and leads to chronic inflammation in the body that causes serious, permanent health problems or even death. 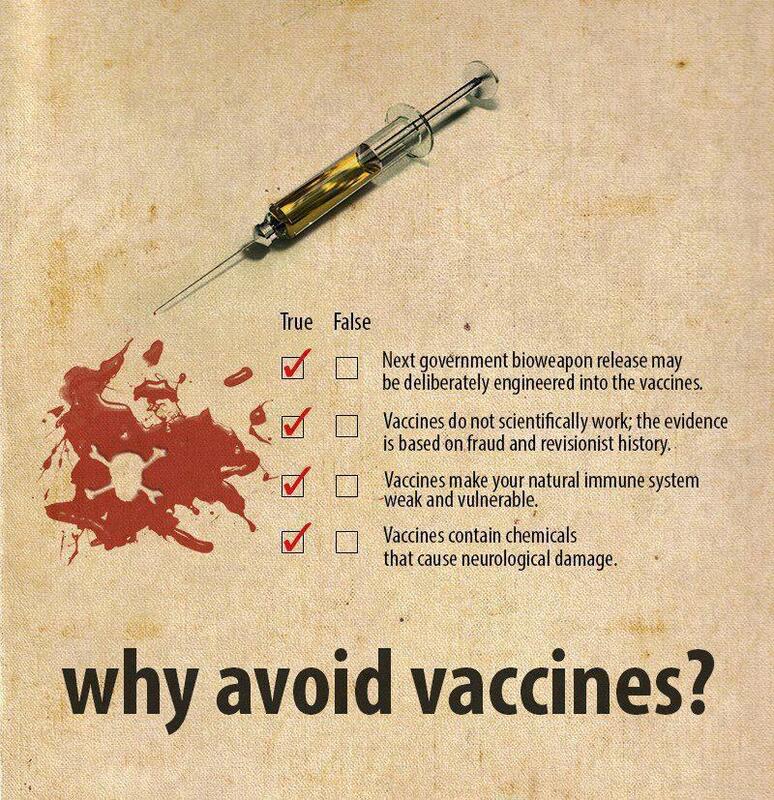 Always read the vaccine manufacturer’s product information insert for descriptions of vaccine studies, precautions and reported vaccine reactions, injuries and deaths. You can also view vaccine reaction reports at NVIC.org. Are Some People At Higher Risk for Vaccine Reactions? Like with prescription drugs, adverse responses to vaccines can vary from person to person. The National Vaccine Information Center opposes intimidation and sanctions against any American, who declines a flu shot, because it violates the ethical principle of voluntary, informed consent to medical risk-taking. We do not need to vaccinate for all the pathogens on earth, since all pathogens are inducing disease and death and disability via a singular common set of mechanism. It is these mechanism that need to be addressed on an as needed basis. This is now do -able it always was. Louis Pasteur’s germ theory was just that, a theory. His contemporaries, Dr Antoine Bechamp and Dr Rudolph Virchow were closer to the truth as to the cause of disease. Remarkably, this means that much of what we are doing in western medicine is wrong, we have been practicing medicine in a state of confusing cause and effect and causing more harm, globally, than good – for over 200 years! The laws that govern blood flow in the human body are the same laws that govern movement in our universe. These are electrical and chemical forces. Cause is never to be found in chemistry. Chemical changes is an effect. Cause is found in electrical forces, that are a part of all substances that have Mass. Western medicine ignores the electrical nature of the human physiology, largely due to a lack of understanding, and an inability to profit off of basic facets of nature freely available to us all, electricity, electrostatics, and water – of all things. The body is 75% water by weight. Blood is 95% water. This water has an electrical component as much as all mass and matter in our universe has an electrical component. This electrical component is critical to blood flow, blood carrying capacity, healing, and functions at the cellular level. I chose to walk away from Western medicine and 20 years of award winning post secondary education last year. I will not go back. I had no choice. My integrity and knowledge prevented continuing on. When the standard of care in medicine forces you to cause harm to a fellow being, and you know this, then one has an ethical dilemma or selective attention. If I remained in the medical profession doing what I now do, saying what I now say, they would take my medical license away, for whatever reason. You would then be told “you cannot listen to Dr. Moulden..he has lost his medical license.” They cannot take away something I choose not to use. My knowledge is not tied to renewing a license. If you drive for twenty years, and choose not to renew your drivers license, this does not negate the fact that you know how to drive a car. The only person who knew the true magnitude and reach of my discoveries was Dr Bernard Rimland, founder of the autism research institute and Defeat Autism Network protocol in the United States. Unfortunately, Dr. Rimland passed away a year before I was ready to start coming public with my work. emarkably, some very prominent scientist-advocates in the autism spectrum world know of my work, however, my work threatens their organizations as well, which creates more blocks. One cannot justify spending a 5 year, 5 million dollar research grant assessing the effects of measles virus on macaque monkeys when someone has shown you that the germs are not causing the disease, let alone autism. You cannot justify charging families $5000 to receive gastrointestinal work ups, when it is now shown that the gastrointestinal problems are a symptom of the same pathology that is causing brain damages, ischemia. 23.) Have you ever been called in to testify in court? I am before the courts now. Two “torpedoes” in the water I suppose. One case is an adult University professor who now has dementia after Hep A and Hep B vaccines. The other is a case of sudden infant death after DTap/MMR vaccine. These cases will be the litmus test and I have buttressed both with the same evidence, all vaccines, across all diagnostic end points, are creating the same measurable, reproducible, quantifiable, neurological ischemic damages. The courts are dragging their feet. 24.) What, in your opinion, is the role of the WHO, and that of the CDC? My opinion is that they are being controlled by the very groups that profits from selling us sickness and disease and symptom based palliative care based on lack of understanding as to the cause of human disease and disorder, in cause, prevention, and treatment. The entire grid of checks and balances has been corrupted, in knowledge, power, direction, goals, methods, beliefs, legislation, and appointments. Human health and wellness cannot be mandated at the end of a syringe or in a one size fits all anything. Cut, burn, and poison is not health care. May any future deaths from these diseases be on your shoulders. Sleep well, sheep.